Schulten Ward Turner & Weiss, LLP partner, Andrea L. Pawlak, recently provided testimony to the Georgia House of Representatives Committee on Banks and Banking and the Georgia Senate Committee on Banking and Financial Institutions about a proposed law regarding spend-thrift trusts. The committees' willingness to hear recommendations by various professionals who will be impacted by a proposed law helps build confidence in both the process and any resulting legislation. 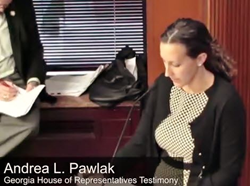 Andrea L. Pawlak, a partner at the Atlanta-based law firm of Schulten Ward Turner & Weiss, LLP, recently provided testimony before the Georgia House of Representatives Committee on Banks and Banking and the Georgia Senate Committee on Banking and Financial Institutions. Pawlak spoke about legal issues related to HB 441, which relates to self-settled spend-thrift trusts. Pawlak has practiced law at Schulten Ward Turner & Weiss, LLP for ten years and primarily represents clients in the areas of commercial and business litigation. She continues to establish herself as one of the leading attorneys in her field and has been named to Super Lawyers Magazine’s list of Rising Stars for eight consecutive years. About Schulten Ward Turner & Weiss, LLP: Since 1986, the attorneys at Schulten Ward Turner & Weiss, LLP have provided quality legal representation and excellent client service to individuals and businesses in the United States and across the globe. The firm assists clients in achieving their goals in a wide range of legal matters, including those related to business transactions and litigation, commercial real estate, banking, employment law, taxation, and white collar criminal defense.